This is an appropriate moment to pay tribute to Francesco Rutelli, the out-going Italian Minister for Culture. He came into post in May 2006 and his name was quickly associated with the fight to combat the looting of Etruscan cemeteries. "The Tomb of the Roaring Lions" at Veio (June 2006). Rutelli: "Sometimes the smugglers arrive before the archaeologists, but luckily they could not remove the frescoes" ("Suspected tomb raider leads archaeologists to frescoed Etruscan tomb near Rome", AP, June 16, 2006). Rutelli: "When I talk about cooperation, it is also to give the new Getty management the opportunity to show they want to close an era" (Elisabetta Povoledo, "Italy Calls Its Talks With Getty Productive", New York Times, June 20, 2006). In September 2006 thirteen antiquities were returned from Boston, and the Getty returned forty pieces to Italy in November 2006 and August 2007. The results of these negotiations went on display in the the first of two exhibitions, "Nostoi", of returned antiquities in Rome, December 2007. These were supplemented in January 2008 by ten items from New York collector Shelby White. But the highlight was the triumphal return in January 2008 of the Sarpedon krater from the Metropolitan Museum of Art in New York. One of the exit routes for antiquities looted from Italy has been Switzerland. A new deal was signed between Italy and Switzerland in October 2006 and Rutelli made the point, "Traffickers will have to go somewhere else" (Ariel David, "Italy and Switzerland sign deal to combat antiquities trafficking", AP, October 20, 2006). 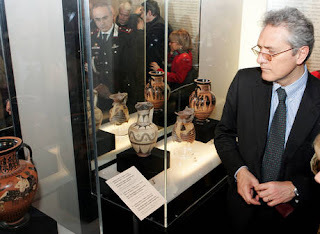 But Rutelli was interested in the international market and he ensured that Italy returned looted antiquities to Pakistan (June 2007) and Iran (November 2007). Rutelli's forceful, yet gracious, discussions with museum directors have highlighted the problems associated with acquiring recently surfaced antiquities. Curators have started to take the due diligence process a little more seriously in the light of his campaign.